The Dainese D Air Misano racesuit uses the Intelligent Protection System which combines a wireless air bag system with highly evolved microprocessor technology to increase the level of protection available to motorcyclists. Internal sensors and a GPS signal distinguish the factors inherent in an accident and inflates the air bag, adding extra protection to the collarbone area. GPS allows rider telemetry to be downloaded, including lap times, maximum speed and trajectory plotting with instantaneous speed and acceleration via a USB port and downloadable software. All the electronic components are housed within the Misano's speed hump. In the event of a violent crash, D-air can trigger in less than 15 milliseconds. When the crash dynamics are less sudden, the sophisticated triggering algorithm assesses conditions and can decide upon a slightly longer triggering time. D-air works in synergy with existing body armor in race leathers, shielding the shoulders and collar bones in the rider's body. D-air reduces the risk of direct helmet impact on the collar bones, limits and reduces helmet movement during rolling. Protection is achieved without compromising the ergonomics and comfort of racing leathers. Tests carried out in accordance with the current European standards for shoulder armor (EN 1621-1/97) show that D-air protection reduces the force transferred by over 85% compared with traditional composite body armor. D-air is the intelligent airbag-based protection for motorcyclists’ safety on the track. 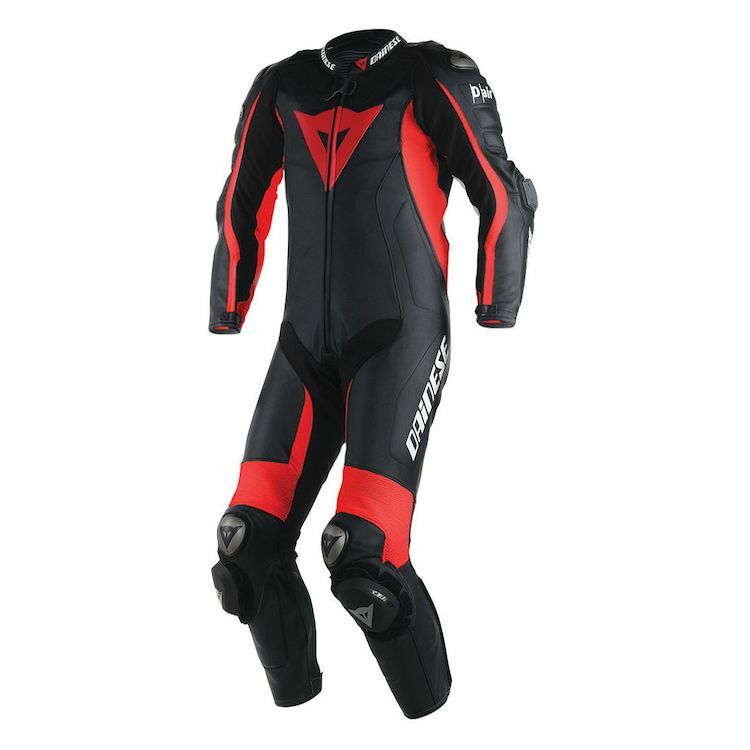 The Dainese D-Air Misano suit requires registration with Dainese. Due to the technical nature of the D-Air System, special care and maintenance is required. For example, the suit must be overhauled every 5 years and air bag battery charged every 2 months. If the air bag is deployed, the suit must be sent to Dainese for inspection and to reset the air bag. Owners of the suit are responsible for any costs associated. Please read the User Manual in detail, and let RevZilla know if you have any additional questions. Note: No telemetry downloading software CD is included as indicated by instructions, the software is available for download from 2D-Datarecording.